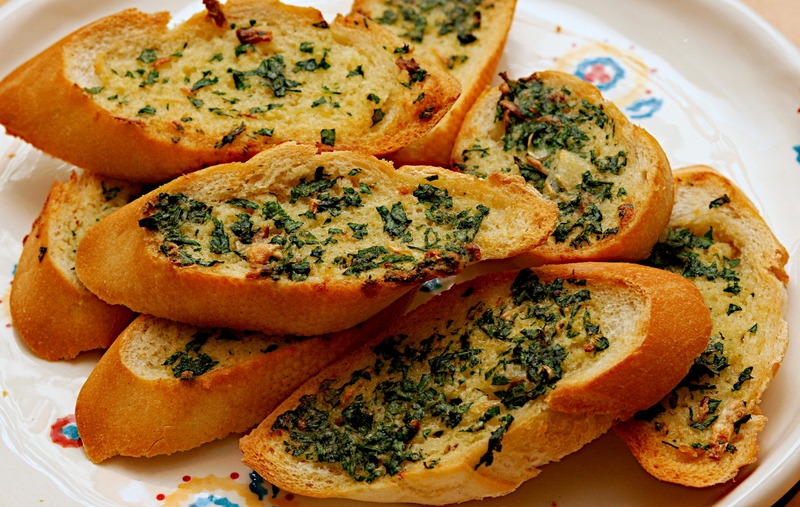 We love garlic bread but often the garlic is too raw and over-powering and it doesn’t love us back. For these toasts we roasted the garlic first before making the butter which gives a more subtle flavour. You can make the garlic butter in advance. Put garlic and olive oil in a small roasting tin and season with salt and ground black pepper. Cover with foil and roast for 20 minutes. When cooked and golden, remove from oven, cool slightly and then mash the garlic cloves in a small bowl with a fork. Add the butter and parsley and mix thoroughly. Put bread on baking tray, spread with the garlic butter and bake until crisp (roughly 5-10 minutes). We served this with Jamie Oliver’s Pasta Bake to great effect. I find Garlic Bread too overpowering and tend not to eat it. However, I will definately be doing this from now on. Really simple too. Roasted garlic is so different and has such a wonderful flavor. This looks like a great idea.